There’s certainly no shame in taking the party indoors when temperatures fall below zero. Or maybe you’re one of millions of condo or apartment dwellers who are prevented from owning an outdoor grill because of rules and regulations, fire codes, space constraints. Several years ago, I wrote an entire book on the subject with the straightforward title, Indoor Grilling. It features 270 recipes that can be adapted to fireplaces, contact grills, panini grills, cast iron grill pans, built in or freestanding electric grills, indoor smokers, and even indoor rotisseries. Indoor grilling belongs to a barbecue tradition that began with our earliest cave-dwelling ancestors. If it’s likely that the first barbecue was accidental—the result of a lightning strike, for example—it’s equally likely that the first deliberate act of grilling took place indoors. After all, archeologists have discovered Paleolithic cave sites containing the remains of prehistoric cooking pits. The ancient Greeks and Romans certainly grilled indoors as well. The hearth was literally and spiritually the focal point of the home. Indeed, our word focus comes from the Latin word for hearth. The fireplace was the cooking center in the homes of medieval Europe, too. If you are lucky enough to own a wood-burning fireplace, you can cook foods indoors that are imbued with flavorful wood smoke using all the techniques you’d use outdoors: direct grilling; indirect grilling; smoking; spit-roasting; and grilling in the coals or ashes. In addition to a long-handled grill hoe or garden hoe for raking embers, you’ll need grill gloves and tongs. 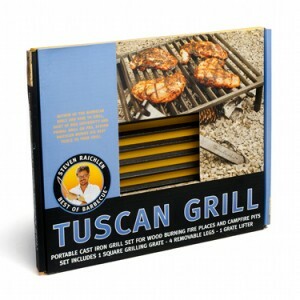 My Best of Barbecue cast-iron Tuscan Grill is optional, but very useful for direct grilling steaks, chops, fish fillets, chicken breasts, vegetables, and fruits. There are other ways to get grill marks, of course. Cast-iron grill pans, such as one made by Lodge, cost less than $15. 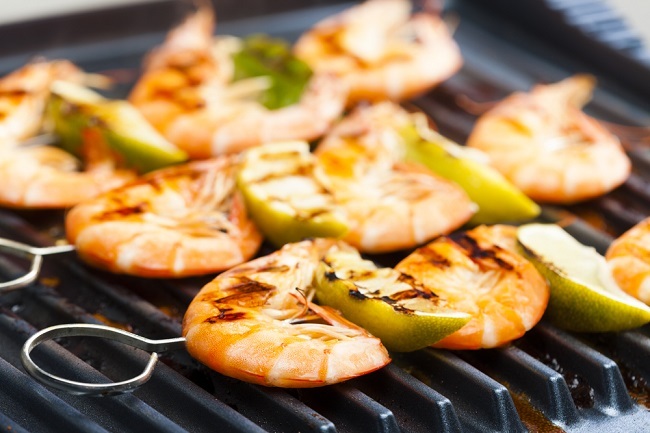 Many panini grills have reversible cooking surfaces—one side is smooth and the other is ridged. They have the advantage of cooking from the top and the bottom, cutting cooking time in half. Perhaps your kitchen even has a built-in electric grill, which is very similar to an outdoor gas grill. You can even smoke indoors with devices such as Camerons Stovetop Smoker. (I often use mine for hot-smoked salmon. Find the recipe here. Or you can improvise using a foil-topped wok, hotel pan, or covered cake pan. Note: You may want to disable your smoke alarm before attempting to smoke indoors. 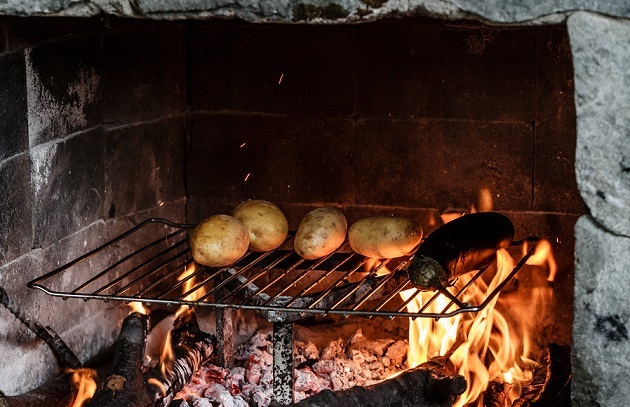 Do you have any photos of yourself grilling in your fireplace? Please share them with us on Facebook, Instagram, Twitter, or the Barbecue Board.